Jakub Janda interviewed former Major League pitcher Greg McCarthy, who is pitching and coaching with the Czech Extraleague club AVG Draci Brno since last year. Jakub Janda: Greg, could you briefly describe your baseball career till 2010? Greg McCarthy: I got drafted out of high school by the Phillies, went in the Rule V draft by the Expos and went to the Major Leagues with Montreal Expos. Injured my shoulder while with the Expos and needed surgery. After that, went to Cleveland Indians and went to high A ball. Spent time in Seattle in AAA with 59 innings and 94 strikeouts (3rd on the team with strikeouts as a reliever) then I was on the team for the next 2 seasons. After I left the Mariners, the Yankees picked me up and was with them for a few weeks. The following season my velocity dropped and so I was released early by the Brewers and signed with the Marlins. That year I was injured again and had my second shoulder surgery. After that, played in independent leagues, in Mexico and Holland and now here in Czech. JJ: What do you consider your career highlight? GMC: Career highlight was when I was in the Major Leagues and struck out 5 consecutive batters against the Oakland A’s. JJ: Do you have something on the baseball field what you would do differently if given the opportunity to change that? GMC: If I had something to do differently, I would probably have done more shoulder exercises and taken better care of my arm. JJ: What literally persuaded you to join the Czech Extraleague? GMC: I came to Czech because I wanted to make a difference with the baseball here. JJ: What were you first impressions after first few weeks? GMC: My first impressions were that the attendance and fans were lower than I expected. I thought there would be more people coming to the games. JJ: How would you comment the Czech mentality, on and off the field? GMC: There are some times where the Czech mentality is helpful to the baseball and other times where it hold back progress. JJ: What were your responsibilities for Draci Brno and for the Czech national team? GMC: I was third base coach for Draci and the National Team and I am a relief pitcher for Draci. JJ: Give us your insight on the team you played for. 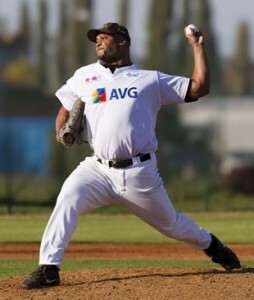 JJ: What changes would you recommend to the Czech baseball association or the whole Czech baseball community? GMC: It shows the lack of play and practice time when the National Team goes up against competition with players who are full time baseball players. JJ: What are your future plans? Do you already have your 2011 schedule up? GMC: For the future and 2011 schedule it is not yet decided. Mister-Baseball thanks Jakub Janda and Greg McCarthy for the interview.